Payment can easily Ideal. The furniture should be paid in advance. Upon receipt of your payment, we will start production immediately. Our delivery time is approximately three weeks. For order amounts above EUR 750, - we offer a free address in the Netherlands (except the Frisian Islands). For other orders, the cost depends on weight and size. These shipping costs are always quoted in advance so you do not post for surprises. The packages can also be picked up at our warehouse in Rotterdam, which you saved the delivery. 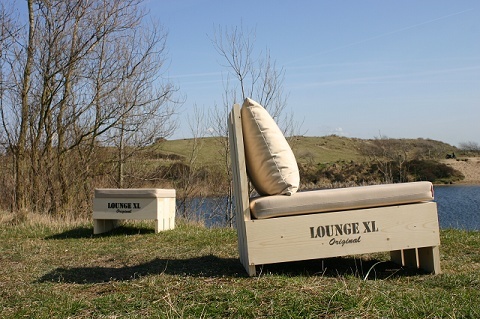 LoungeXL the furniture parts are made of pine sexta falling in durability class 3, and based on bid available in FSC. The material is a natural product and subject to warping. For outdoor use can weather the typical appearance of the wood used scaffold forest floor. The durability depends on the quality of the bond and the possible fitting of the wood. Because of these different variables can not guarantee a certain lifetime issued. Colors of the substances may differ from actual materials by screen display.